Stephen Rouse over at IGLOO gave me a heads up on a new blog that tries to explore the “differences and similarities between US and European startup success stories”. 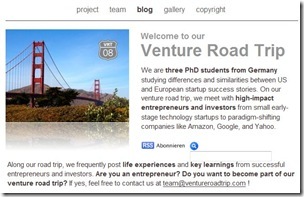 Created by three German PhD students who currently travel through the United States, Ventureroadtrip.com profiles entrepreneurs and investors in short video clips. Ralf Schmelter, Carsten Ruebsaamen and René Mauer use the blog to capture some of the impressions from their research trip. For now they mostly seem to focus on short video profiles of startup companies. Once the research phase is over, I hope they will also share some of their insights and observations on emerging patterns/trends with us. Ralf, Carsten and René are still looking for more entrepreneurs to participate in their research. For anyone who is interested, head over to Ventureroadtrip.com to get in touch with them.